The first was Happiness Cupcakes, located at 614 S. Texas Blvd. The intruder broke a front window, entered, and stole the cash drawer, which had no money in it. No mention of any cupcakes being stolen. Surprisingly, the cash drawer, taken in the "cupcake burglary," was recovered in the alley of 1st Cash Pawn, 131 S. Texas. If you saw any suspicious activity at either of these locations during the nighttime hours of October 4, give Weslaco Crime Stoppers a call. The number is 956-968-8477. If your tip is instrumental in the burglar`s (or burglars` ) arrest(s), you become eligible for a cash reward. And you always remain anonymous. The door withstood the pounding, and the men fled in the 3 vehicles they came in. The men did not make entry, but there was damage to the door, doorknob, and door frame. 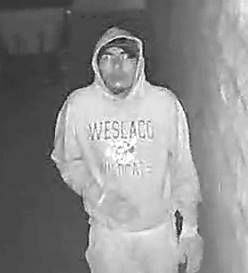 If you have any idea who tried to break in to this home, call Weslaco Crime Stoppers at (956) 968-8477. If your information leads to an arrest, you become eligible for a cash reward. All callers remain anonymous. Taken were cash, snacks and drink mix, laptop computers, and kitchen equipment. The burglaries probably occurred at night. The burglars may have been selling the stolen items to nearby residents. If you have any idea who is committing these burglaries, call Weslaco Crime Stoppers at 956-968-8477, or leave a tip on this website. An arrest will make you eligible for a cash reward. Tipsters remain anonymous. Burglars struck Cisneros Jewelry, 337 S. Texas Blvd. during the morning hours of Wednesday, July 27. The store`s burglar alarm activated about 1:35am. Three young men, wearing bandannas on their faces broke the front door glass and the glass in a display window, trying to enter the store. They were foiled by metal bars inside the entry door. Unable to enter, the three men fled to their getaway car in the alley. The vehicle was a white van. The burglars wore T-shirts and shorts. Because they could not get inside the store, nothing was taken. A local convenience store, Valley Food Mart, 2504 N. Bridge Avenue, was broken into about 5a.m., on Sunday, July 10. One or more burglars broke the drive-thru window and entered the premises. Taken in the burglary were cash and two display stands, one for tobacco pipes, the other for knives, and the merchandise they held. A security camera was ripped off a wall. If you have any idea who is involved in this burglary, call Weslaco Crime Stoppers at 956-968-8477, or leave a tip on the Crime Stoppers website. As always, callers remain anonymous. If your tip leads to an arrest, you are eligible for a cash reward. Last weekend, thieves entered the property of Valley Nature Center, 301 S. Border Avenue, and stole several items. 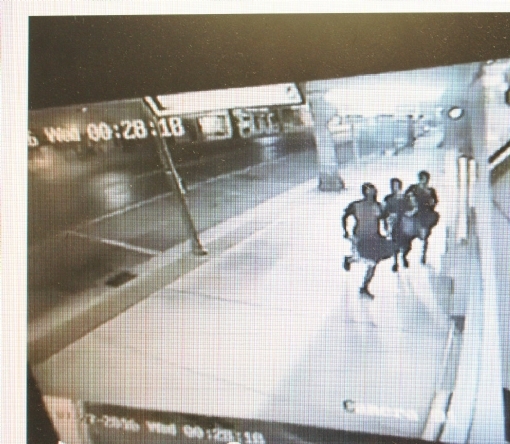 Surveillance video showed 3 men arrive, tamper with one camera, leave, then return at about 12:45a.m., on Sunday, June 12. The men took a black wheelbarrow, a black utility trailer, and 2 large bags of potting soil. Video and suspect descriptions are not available yet. A person of interest in the surveillance video needs to be identified. 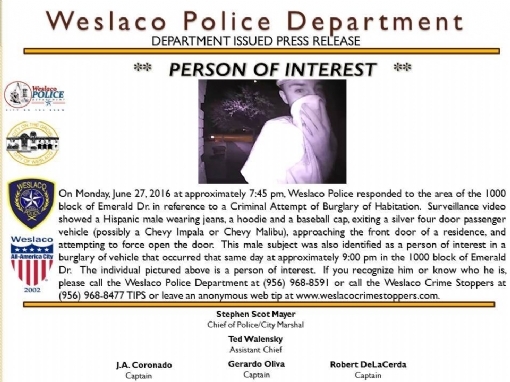 If you know who this man is, call Weslaco Crime Stoppers. 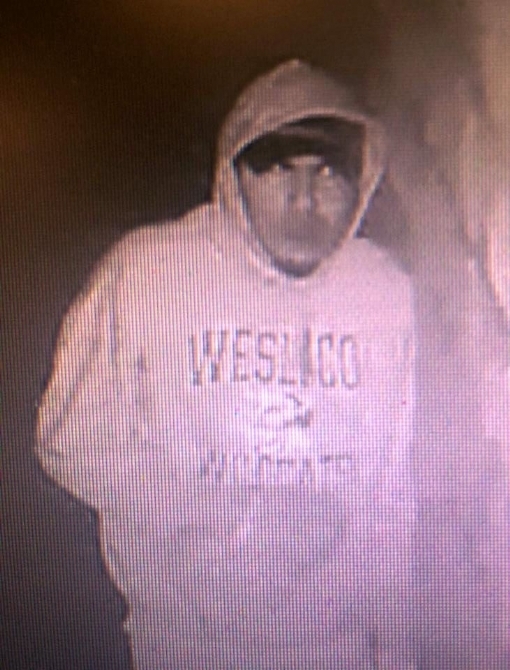 If you have any idea who committed this theft at the nature center, call Weslaco Crime Stoppers at 956-968-8477, or leave your tip on this website. An arrest makes you eligible for a cash reward. You will remain anonymous. If you have any information about this burglary, call Weslaco Crime Stoppers at 956-968-8477. If your information leads to an arrest, you become eligible for a cash reward. You will remain anonymous. 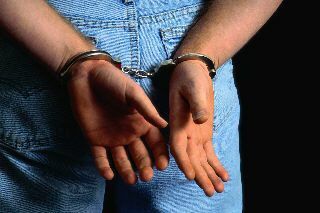 A burglar make quick work of the burglary of a homeowner`s storeroom, on Wednesday, May 25. . Between 5am and 10:30am, a burglar entered the unlocked storeroom and made off with several items. The burglary occurred in the 3300 block of South Westgate. Taken were a Craftsman mower (black color), a hoe and rake, and a blue ice chest. The value of the items was over $400. The victim had no idea who might have taken her possessions. If you have any idea who took the resident`s items, call Weslaco Crime Stoppers at 956-968-8477. If your tip leads to an arrest, you become eligible for a cash reward. And you always remain anonymous. A dark-colored 4-door car, at about 4am, pulls up to a house on South Missouri Ave. The driver turns off the headlights. Silently, three men get out and approach a yard full of innocent, bountiful plants. All three grab flower pots (with plants), stealthily walking back to the waiting getaway car. Suddenly, a shout pierces the pre-dawn darkness. The neighbor across the street had been eyeing the 3 thieves, who run for the safety of the car. In the confusion, one of them drops a pot, breaking it into17 pieces. Quickly, the car roars to life, heading north, then turnimg onto Texas Blvd. The plant owner is awakened, police are called, the thieves disappear into the night, perhaps to surface again in some other garden, on some other street, and maybe in some other town.